Distribution: Tricolored blackbird breeding colonies have been documented throughout California, with other small colonies documented in Oregon, Washington, western Nevada, and Baja California, Mexico. Although tricolored blackbirds can be found during the non-breeding season throughout their breeding range, large concentrations are found in Marin, Solano, Santa Cruz, and Monterey Counties. In the Natomas Basin, nesting colonies have been documented on the Betts-Kismat-Silva tract of the Central Basin Reserve and on the Frazer North tract of the North Basin Reserve. The Frazer North colony has also nested on private land in a large patch of Himalayan blackberry near the northern border of the Natomas Basin. Habitat Requirements: Tricolored blackbirds nest in emergent marsh vegetation, such as tules and cattails, and in willow and bramble thickets. Mustard and thistle may also be used for nesting, and in some areas, tricolored blackbirds will nest in agricultural stands of triticale or other grains. Tricolored blackbirds require a source of open water within one third of a mile (half a kilometer) of the nesting colony. Foraging grounds contain an abundance of insect prey during the breeding season and consist mainly of pond margins, irrigated pastures, flooded rice fields, dairies, and croplands. Reproduction and Demography: Tricolored blackbirds nest in dense colonies from mid-March to early July. They build cup nests amidst dense wetland vegetation or thickets, usually within ten feet of the ground. Preferred vegetation is spiny and thick to provide defense against predators. The densest colonies can support up to six nests per square yard. Females typically lay three or four eggs, which they incubate for about 11 days. Young are helpless upon hatching and remain in the nest for 10″“14 days. During the breeding season, adults will forage up to eight miles (thirteen kilometers) away from the colony. Fledged juveniles will move two miles or more from the nest site, while remaining dependent on the parents for food. 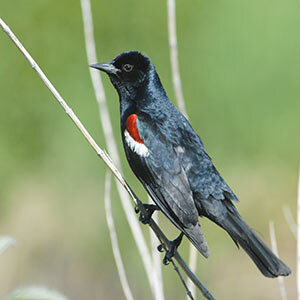 Tricolored blackbirds are polygynous, with each male supporting up to four nesting females. Movement: Central Valley tricolored blackbirds disperse widely in late summer to find food, remaining in nomadic foraging flocks throughout winter. In March and April, tricolored blackbirds move to their initial breeding territories in Sacramento County and the San Joaquin Valley. Tricolors are itinerant breeders and may nest sequentially in more than one location within the same breeding season. Ecological Relationships: As with many songbirds, tricolored blackbirds depend heavily upon insects during the breeding season, consuming beetles, grasshoppers, weevils, and the larvae of aquatic emergent invertebrates. The bulk of the diet shifts to weed and grass seeds once the breeding season has passed. Eggs and nestlings are preyed upon by various vertebrates, including northern harriers, common ravens, black-crowned night herons, cattle egrets, coyotes, and raccoons. It has been reported that in areas where their ranges overlap, the white-faced ibis can protect tricolored blackbird colonies night heron predators..